With more than 3,000 ports delivered, PosiCharge™ systems bring you industry-leading fast charge solutions, outdoor-rated to withstand extreme conditions. Our SVS100 outdoor fast charge system is compact and well suited for light duty airport ground support applications such as small cargo warehouses, GA and FBO airport operations, regional jet operations, and for charging other large electric equipment operating in a non-hub environment. As the airlines’ preferred choice in fast and energy-efficient charging systems, PosiCharge DVS330, MVS & GSE are Multi-Port systems ideal for airport applications. 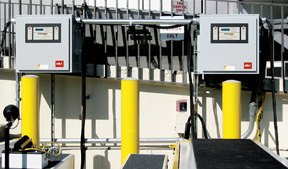 Our Multi-Port systems are customizable for the airport ground support equipment market. Download our complimentary Outdoor Fast Charging Systems primer.